Caution: Ordinary Folks Beware!! 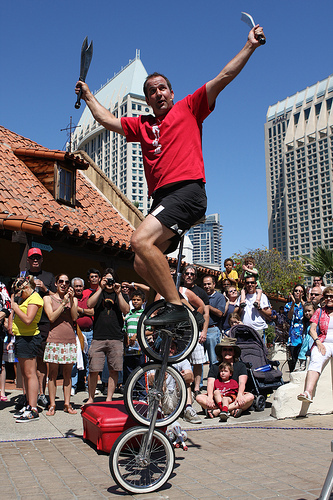 Seaport Village’s Spring Busker Festival comes to San Diego this Saturday and Sunday with a dynamic line-up of over-the-top street performances from jugglers, sword swallowers, contortionists, stuntmen and more. This is year, Seaport Village is celebrating its 30th anniversary and the FREE festival is expected to be the best yet! The festival takes place on Seaport Village’s cobblestone streets from 12 – 5 p.m., but from 7 – 10 p.m., the performers will be let loose for Buskers After Dark, an untamed show of bizarre and extraordinary talents best suited for those18 years and older. If you’re in the mood for warm, fresh-baked apple pie then you need to mosey on over the Cuyamaca mountains to Julian for the 2nd annual Taste of Julian event. This Saturday from 1 – 4 p.m., you can tour and taste menu specialties and local favorites at more than 10 restaurants. Tickets are $20 per person and can be pick-up or purchased at the Town Hall in downtown Julian. Where are all my fashionistas and fashionistos? THREAD, a one-day retail extravaganza showcasing the trends to come in the fashion world will be in town this Sunday from 11 a.m. – 5 p.m. at the Horton Plaza Event Space in downtown San Diego. Here, you can browse and buy discounted men, women and children’s clothing from tons of independent designers along with indie art, furniture, accessories and more. Be sure to stop by the Style Lounge for free hair and makeup and enjoy drink specials in the stylish Martini Lounge. Admission to this Godsent event is $10 and includes show entrance, fashion show admittance, music and a gift bag for the first 250 people in the door. This Saturday, the New Children’s Museum in downtown San Diego will host a day full of music just for kids during their Kidchella Music Festival from 10 a.m. – 4 p.m. Performances will take place inside the museum and outdoors in the park with multiple genres of music for kids to sing, clap and boogie. Saturday also kicks-off a new museum series called “Explore AEC” in the museum’s Arts Education Center. Throughout the day, kids and families can take part in activities and crafts like Superhero Hideout, Play with Your Food and Flying Felt Bird; museum admission is $10 per person. This Saturday, the Carlsbad Flower Fields will be alive with the sound of music during Bluegrass Day – a toe-tapping concert of old-time jams and Bluegrass classics from 12 – 4 p.m. Also on Saturday, and continuing on Sunday is The Flower Fields annual Arts & Culture Fair featuring painting, pottery, crafts and photographs from some of Southern California’s best artisans from 9 a.m. – 6 p.m. both days. Admission to these events is included in the $10 Flower Field admission. This entry was posted in San Diego Events and tagged 5 to try, arts, Carlsbad, fashion, festival, flowers, food, free, Julian, live music, museum, music, seaport village, spring, things to do, what to do by Stephenie. Bookmark the permalink. Julian has the best pies on planet earth. Its far for me, but I WILL drive all the way just for pies. If you have not tasted one, you are truely missing out.